Cephalonia (GB) Your browser does not support any audio element. The Greek Islet (also Kefallinia, Kephallonia, Zephalonia) with some secondary islands over 900 km ² is the largest of the Ionian Islands, The main town is Argostolion. Already closed Homer Times (8th century BC) wine was grown here. In the course of its history, the island was under the rule of the Romans, Franks, Turks, Venetians, French and English. In 1953 there was a severe earthquake, almost half of the population left the island. In the 1980s, the island first appeared on the island phylloxera on and caused huge problems. The dry white wine Robola of Kefallonia (also short Robola or Rompola) is unmixed from the variety Robola pressed. 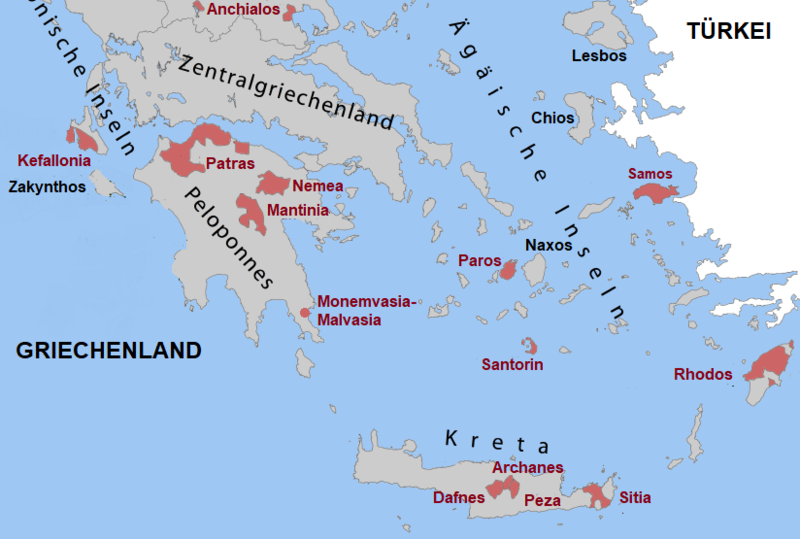 This is the only Greek appellation named after a grape variety. The vineyards cover 180 hectares and are located in the southern part of the island, on the plateau of Omala. This page was last modified at 14 February 2018 at 15:04.